Nitrate is a naturally occurring molecule which contains 3 oxygen atoms surrounding a central nitrogen atom. Nitrate is formed naturally by bacterial nitrogen fixation and is therefore found in soils, effluents and surface waters. Nitrate is also produced artificially on a commercial scale, used as a preservative in cured meats and, due to its high solubility and biodegradability, as a carrier for other nutrients in fertilizers. Why is an excess of nitrate a concern? 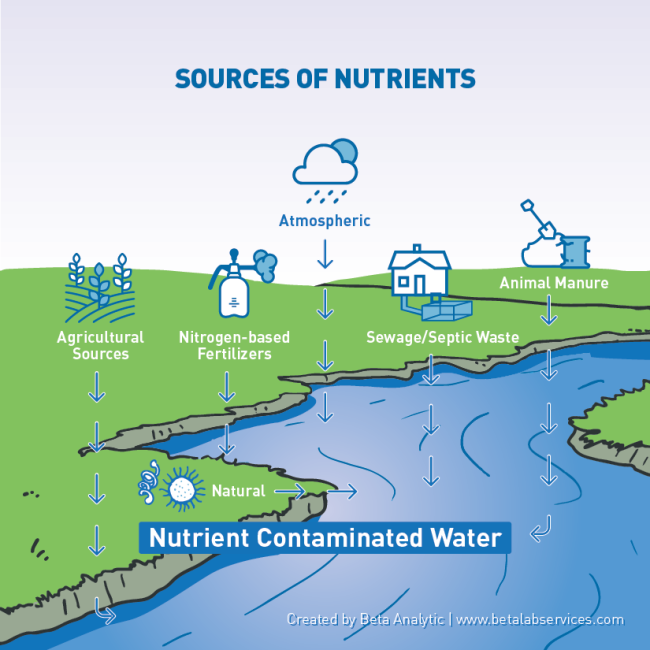 The overuse of nitrate-based fertilizers, natural and artificial, in this past century has resulted in an abundant amount of nitrate in top soils, which is then transported into the water table via infiltration. High concentrations of nitrate in drinking water can be toxic (10mg/L or higher EPA, 2018), starving blood of oxygen via methemoglobinemia. Furthermore, high levels of nitrate in surface waters will cause an overstimulation of algal growth. These algal blooms block sunlight and create anoxic zones (very low concentrations of dissolved oxygen) which create an uninhabitable environment for marine life. Eutrophication can have large negative impacts on marine and fishery industries. ISO 17025-accredited Beta Analytic provides nitrate concentration and isotopic measurements, which can be used to decipher the source(s), environmental alterations and fate of nitrate in the environment. A nitrate molecule naturally contains different isotopes of oxygen and nitrogen, the most common being oxygen-16 and nitrogen-14 and the rare being oxygen-18 and nitrogen-15. As nitrate is formed and utilized naturally or artificially, the mass of the nitrate molecule varies. These differences are expressed as delta values and are compared to internationally accepted standards. A nitrate molecule in nature will likely be altered, for example by denitrification, a process by which bacteria utilizes NO3– . During denitrification, microbes preferentially target the nitrogen-14 and oxygen-16 bearing nitrate molecules, leaving the residual nitrate enriched with the oxygen-18 and nitrogen-15 isotopes. Nitrification has the opposite effect. Source, oxygen availability, pH and land use all play a part in the isotopic values of nitrate and should be considered when analyzing isotopic data. The isotopes of nitrate are a useful tool in understanding where nitrate is originating from and what processes the molecule had undergone before reaching your sample vial. Beta Analytic performs fast, ISO 17025-accredited oxygen and nitrogen isotope measurements using an isotope ratio mass spectrometer (IRMS). Results are reported in 14 business days. Aravena, R., Evans, M. L., & Cherry, J. A. (1993). Stable isotopes of oxygen and nitrogen in source identification of nitrate from septic systems. Groundwater, 31(2), 180-186. Hosono, T., Tokunaga, T., Kagabu, M., Nakata, H., Orishikida, T., Lin, I. T., & Shimada, J. (2013). The use of δ15N and δ18O tracers with an understanding of groundwater flow dynamics for evaluating the origins and attenuation mechanisms of nitrate pollution. Water research, 47(8), 2661-2675. Isotope Tracers in Catchment Hydrology (1998), C. Kendall and J. J. McDonnell (Eds.). Elsevier Science B.V., Amsterdam. pp. 519-576. Li, S. L., Liu, C. Q., Li, J., Xue, Z., Guan, J., Lang, Y., … & Li, L. (2013). Evaluation of nitrate source in surface water of southwestern China based on stable isotopes. Environmental earth sciences, 68(1), 219-228.